Isaiah 19:11 The princes of Zoan are utterly foolish. The counsel of the wisest counselors of Pharaoh has become stupid. How do you say to Pharaoh, "I am the son of the wise, the son of ancient kings?" Isaiah 19:13 The princes of Zoan have become fools. The princes of Memphis are deceived. They have caused Egypt to go astray, who are the cornerstone of her tribes. Isaiah 30:4 For their princes are at Zoan, and their ambassadors have come to Hanes. Ezekiel 30:14 I will make Pathros desolate, and will set a fire in Zoan, and will execute judgments on No. The city is only once noticed in the Pentateuch (Numbers 13:22), as having been built seven years after Hebron, which existed in the time of Abraham. Zoan was certainly a very ancient town, since monuments of the VIth Egyptian Dynasty have been found at the site. 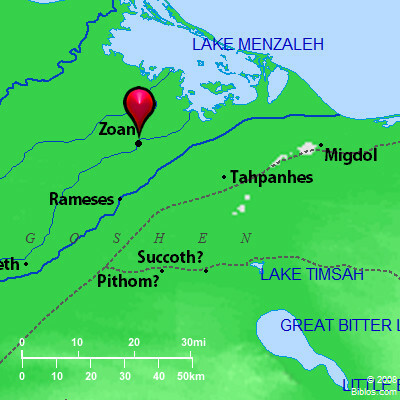 It has been thought that Zoar on the border of Egypt (Genesis 13:10) is a clerical error for Zoan, but the Septuagint reading (Zogora) does not favor this view, and the place intended is probably the fortress Zar, or Zor, often mentioned in Egyptian texts as lying on the eastern borders of the Delta. Zoan is noticed in the Prophets (Isaiah 19:11, 13; Isaiah 30:4 Ezekiel 30:14), and its "princes" are naturally mentioned by Isaiah, since the capital of the XXIIInd Egyptian Dynasty (about 800 to 700 B.C.) was at this city. In Psalm 78:12, 43 the "field (or pastoral plain) of Zoan" is noticed as though equivalent to the land of GOSHEN (which see). Zoan was the capital of the Hyksos rulers, or "shepherd kings," in whose time Jacob came into Egypt, and their monuments have been found at the site, which favors the conclusion that its plain was that "land of Rameses" (Genesis 47:11 Exodus 12:37; see RAAMSES) where the Hebrews had possessions under Joseph. It is probably the site of Avaris, which lay on the Bubastic channel according to Josephus quoting Manetho (Apion, I, xiv), and which was rebuilt by the first of the Hyksos kings, named Salatis; for Avaris is supposed (Brugsch, Geog., I, 86-90, 278-80) to represent the Egyptian name of the city Ha-uar-t, which means "the city of movement" (or "flight"), thus being equivalent to the Semitic Zoan or "migration." It appears that, from very early times, the pastoral peoples of Edom and Palestine were admitted into this region. The famous picture of the Amu, who bring their families on donkeys to Egypt, and offer the Sinaitic ibex as a present, is found at Beni Chasan in a tomb as old as the time of Usertasen II of the XIIth Dynasty, before the Hyksos age. A similar immigration of shepherds (see PITHOM) from Aduma (or Edom) is also recorded in the time of Menepthah, or more than four centuries after the expulsion of the Hyksos by the XVIIIth, or Theban, Dynasty. In the 14th century B.C. the city was rebuilt by Rameses II, and was then known as Pa-Ramessu. The Hyksos rulers had held it for 500 years according to Manetho, and were expelled after 1700 B.C. George the Syncellus (Chronographia, about 800 A.D.) believed that Apepi (or Apophis) was the Pharaoh under whom Joseph came to Egypt, but there seems to have been more than one Hyksos king of the name, the latest being a contemporary of Ra-Sekenen of the XIIIth Dynasty, shortly before 1700 B.C. Manetho says that some supposed the Hyksos to be Arabs, and the population of Zoan under their rule was probably a mixture of Semitic and Mongolic races, just as in Syria and Babylonia in the same ages. According to Brugsch (Hist of Egypt, II, 233), this population was known as Men or Menti, and came from Assyria East of Ruten or Syria. This perhaps connects them with the Minyans of Matiene, who were a Mongolic race. This statement occurs in the great table of nations, on the walls of the Edfu temple. The Hyksos age corresponds chronologically with that of the 1st Dynasty of Babylon, and thus with the age of the Hebrew patriarchs Abraham and Jacob-time when the power of Babylon was supreme in Syria and Palestine. It is very natural, therefore, that, like other Semitic tribes even earlier, these patriarchs should have been well received in the Delta by the Hyksos Pharaohs, and equally natural that, when Aahmes, the founder of the XVIIIth Egyptian Dynasty, took the town of Avaris and expelled the Asiatics, he should also have oppressed the Hebrews, and that this should be intended when we read (Exodus 1:8) that "there arose a new king over Egypt, who knew not Joseph." The exodus, according to the Old Testament dates, occurred in the time of the XVIIIth Dynasty (see EXODUS) when Israel left Goshen. The later date advocated by some scholars, in the reign of Menepthah of the XIXth Dynasty, hardly agrees with the monumental notice of the immigration of Edomites into the Delta in his reign, which has been mentioned above; and in his time Egypt was being invaded by tribes from the North of Asia. ZO'AN, is supposed to be at the modern Zan or San, the Greek Tanis. It is situated on the Tanitic branch of the Nile. It is supposed to be the same as Rameses and is so put down on Map No. 4. The expression "field of Zoan," Ps. 78:12, 43, has been found among the ancient Egyptian inscriptions. TANIS, of Ezek. 30:14 is the same as Zoan.